Today's the day that the City of Copenhagen has launched an international Bike Share Design Competition. Back in 1996, the Bycykel - City Bike - hit the streets. 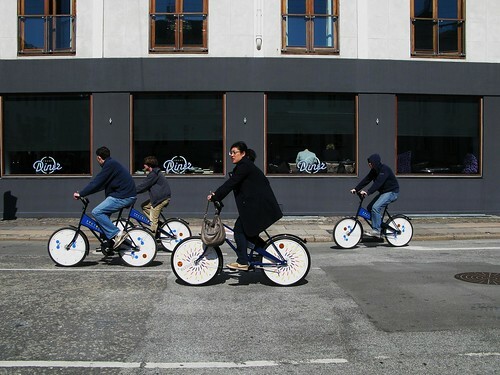 Copenhagen became the first major city to launch a bike share programme. Previously it was only La Rochelle that had managed to maintain a successful programme, albeit small scale. The City Bike was a hit and it was widely covered in the global press. The bikes left much to be desired with their sturdy design but they managed to stick around for 13 years. Mostly the domain of tourists who love the gimmick, the ease-of-use of the bicycles is popular. Running on a shopping trolley system, you stick a 20 kroner coin in and ride it around until you're done, whereafter you get your 20 kroner back. All well and good, but the City of Copenhagen has decided that it's time to evolve. "Much has happened since this Bike Share v. 1.0 was launched and, over the past ten years, many large cities now enjoy exciting, new bike share systems. From Barcelona to Beijing, a new generation of bike share systems have blossomed. To the delight of locals, tourists and commuters alike. Copenhagen is a unique, world-class cycling city and this fact should be refl ected in the city’s bike share system. Our city is the best example of how the bicycle can become the preferred form of transport in a modern city. An attractive and modern bike share system can contribute to strengthening Copenhagen’s bicycle culture. Therefore The City of Copenhagen is pleased to launch an open design competition in order to determine how a bike share system v. 3.0 would look and work in the city in the future." 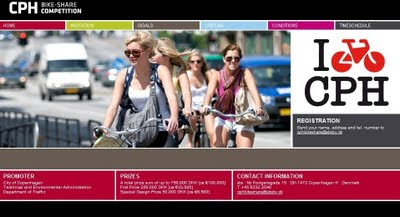 The website is www.cphbikeshare.com. You can download the Competition Programme from the website or right here. All the information you need is on the website. Deadline for entries is November 18, 2009. It's going to be exciting to see what the competition participants come up with.